There are 21 nice and comfortable guest rooms (each with bathroom, heating, safe, cable-TV, telephone and free WiFi). 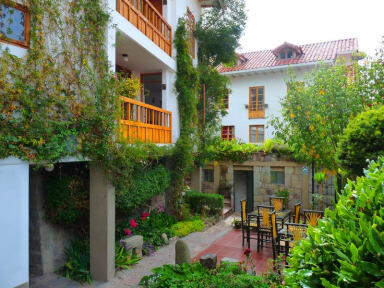 Also there are ample social spaces within a pretty colonial style building, assembled around a blooming garden and with singular views over historic Cusco. The friendly und concerned personnel and the included fresh and abundant natural breakfast-buffet served in a beautiful cafeteria, where you also can be served many delicious dishes, sandwichs, pastries, ice cream cups, refreshments, wines and beers make any stay more than pleasant. This was an awesome place to stay. The staff was very friendly and gave us a free drink at the bar attached to it. Breafast was delicious and was also included. I would deffentially come here again! Loved this place. I will definitely return. It's a great place for travelers that don't want to be in the downtown area but close enough to walk to it. The view is absolutely gorgeous. A friend and I stayed at Hotel Pension Alemana for one night, then left to spend a night in Aguas Calientas, then came back to Pension Alemana for a night. We could not have asked for a better hotel while in Cusco. You had to be buzzed in at the front door, so safety was of no concern, it was a short walk to Plaza de Armas, and the breakfast was very tasty. The hotel was very clean and had an incredible view of Cusco. It was also a HUGE convenience to leave our luggage & it be in our new room. Upon arrival after a long day at Machu Picchu we welcomed into our room, and greeted with complimentary chocolates and pisco sours. The staff was incredible knowledgeable and friendly, giving us great recommendations. We ate at Uchu, a Peruvian steakhouse with superb alpaca steak. Breakfast was fresh with lots of variety, including fruit, eggs, a variety of breads and jams, cereal, yogurt and was served in a adorable little cafe. This was by far our favorite place to stay. Pension Alemana was absolutely fantastic! The rooms were great withcomfortable beds and an awesome view of the city. The staff were more than helpful. The pension has a cafe which served great food so we could easily rest, accimatise and still have delicious food. Breakfast was great including eggs cooked how you like, fresh fruit, yogurt and all you could want. I have stayed in many hostels and would absolutely recommend staying here. Well worth it and a perfect place to enjoy cusco from! Great place with one of the best views in town. Breakfast was excellent & in a really nice safe part of town. Beds were a little bit short, but then again I'm probably too tall. Really beautiful hotel with all of the amenities you could wish for. The cafeteria upstairs was great for the breakfast and well priced! A few issues like for 2 days our WiFi didn’t work and the tv didn’t work. We took a tour to Macchu picchu and had to pay for the night/day that we weren’t there. Also loud noises from construction on the hotel one afternoon. Normal issues, but this place is really expensive compared to other local options. Ok if you want to pay for a European experience. My friend and I booked this as a treat following our 4 day trek to Machu Picchu but were quite disappointed. The room was very cold, which was not what we wanted following days of camping. The room was basic considering the price we paid. However, the breakfast was absolutely brilliant - lots of choice and really tasty. The views from this place are amazing and the staff are really friendly and helpful - plus you get a chocolate on your pillow! Overall, a lovely place just not worth the money!